One year ago, The New Yorker magazine cover featured the work of illustrator Malika Favre’s image of 4 female surgeons looking down at a patient in the operating room on its cover. Assistant Professor of Surgery Dr. Susan Pitt was inspired by the cover art and created her own version with female colleagues. 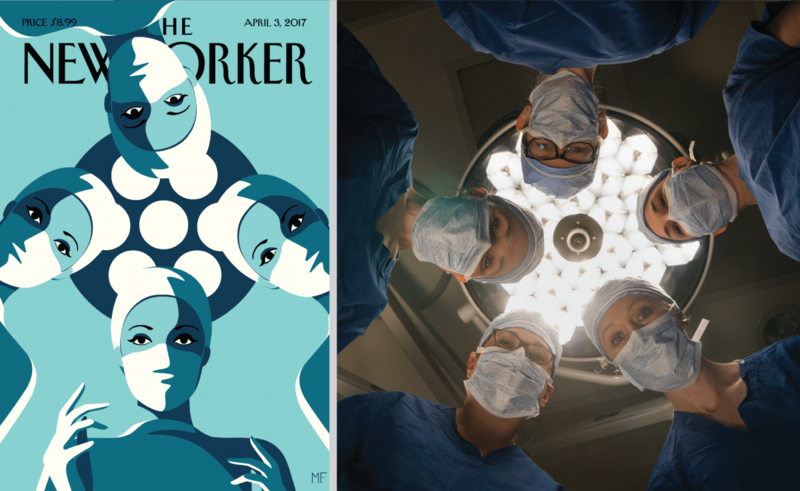 She then challenged women surgeons around the world to recreate their own with the #NYerORCoverChallenge. The challenge became an internet sensation and doctors around the world replicated the image of 4 women surgeons. The number of women who are general surgeons has consistently increased over the past 30 years in the United States. In 1980, only 3.6% of general surgeons were women. In 1995, the number had grown to 8.8%. By 2015, nearly 20% of general surgeons were women. Here at UW, it’s possible to have 4 women surgeons in the operating room at the same time. More than half of the faculty in the Division of General Surgery are women. And nearly half of general surgery residents are women: 22 of 48 are female. During Dr. Wilke’s eight years at UW, the Divisions of General Surgery have recruited 11 female faculty members, including the first female chair in the Department’s history: Dr. Rebecca Minter. “Having a Division with a balanced portfolio of women and men is fabulous for all aspects of our work-life,” says Dr. Wilke. Tune in on Twitter on April 3rd to see women surgeons celebrate women in surgery on the anniversary of the challenge. Read the New Yorker’s own coverage of this challenge and a UW Health article about why Dr. Pitt started the challenge.